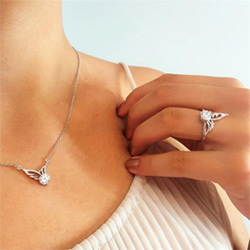 This elegant memorial heart pendant necklace is designed to enable you to hold a source of comfort in your hands and to find peace in your heart. It can also be used to hold crushed flowers, a lock of hair, dirt or sand from a memorable location, or any other tiny object you want to keep close to your heart. A lovely way to show your love and concern for someone else or to have as a memory keepsake for yourself. Cherish your memories and they shall live in your heart forever. Hypoallergenic, durable and comfortable to wear. It has some of my late husband ashes in it and he will forever be by my heart. Thank you very much, I love it. God Bless you. I have gotten these for my children for our loved ones who has passed. This was a gift for my daughter in law. The only thing I would say was that the writing was a tad too little and hard to read. This necklace I bought from my brother and sister-in-law's Birthday Gift Money and it is to hold some of our dear Boxer's ashes as a constant reminder of his gentle soul and his unending loyalty to us. No disappointments in any way! So happy with this piece. Beautiful piece of jewelry for the low price. Just perfect. My Grandson loves it, We put some of his brothers ashes in it n he wears it all the time. Thank you for such a quick delivery. Will be sharing with my sisters when my moms ashes are laid to rest. She loved it. It's beautiful! I am so pleased with my purchase, it's BEAUTIFUL THANK U! I purchased this item for my Daughter In Law after the loss of her Mother. We loved it with the exception of the enraving.....we wished that could have been larger. Love your products and will be ordering from you in the future. Thank You! Prompt delivery and outstanding customer service. Have reordered two more for gifts. This is the second time I have purchased a necklace for a family members ashes this one is so much nicer then the one I bought from someone else and the price is so reasonable. I have put ashes of my mom and dad in this as they are now together forever. i put sand from Maui in it since we always spent our anniversary there this just makes his passing closer to me. What a beautiful way to keep the memory of a loved one close at heart. I absolutely love my necklace. It is the perfect size and great quality and has a good weight to it, not too heavy, not too light. Its perfect for carrying loved ones with you, I will definitely recommend this item and the website to all my friends. The quality of the necklace exceeded my expectations. It's just perfect. I just love it!!!! The staff are the best..they answered my questions promptly and so politely. I loved doing business with them and recommend them highly! Thanks again!!! Every time someone sees it ,I get good compliments it's fabulous. I bought these to put some of my Son's Cremations in. They are perfect. However I sealed them in the wrong position so they don't hang right. I hope you still have them when I can reorder!!! My wife loves her necklace. Fast shipping. Safe and secure checkout. Thank you for everything. This is a great piece. Love the size and quality. There was a minor problem with one of the five charms. Customer service was awesome. Sent a replacement immediately. I would definetly buy from Linda's Stars again! I totally love my necklace it is very special to me. Bought this for one of my Granddaughters for her other Grandmas ashes....She was So Thrilled!! Thank you, good quality!! I bought this for my daughter. I am being Cremated & this for my ashes! No I'm not crazy, just planning ahead!! I bought this as a gift for a friend who lost her daughter. She loved it and wears it all the time. I really loved the feel of these necklaces when I got them. They are 'weighty' in my hand and very pretty. The stopper seems to be very secure - which was a concern of mine before I ordered it. I would recommend these to others who might be considering one! I bought this for a close friend of mine. Her 26 your old son got killed in a motorcycle wreck on April 26, 2016. He was on his way home from work and a car pulled out in front of him. When I gave her this necklace of course she cried. But she loves it and wears it all the time. Thank you for making something that is so special and truly appreciated. I am so pleased with the necklace I received today though I haven't worn it yet. The quality seems perfect - heavier than I expected. Thank you. Our family was in need of these and the response was amazing! Thank you so much! Absolutely love it! Don't care much for the chain style so I just put it on my own and it looks mug better. Everyone loves it! I had a problem with shipping and it was rectified right away. Very good customer service. I would not hesitate to order again. I was looking for a way to keep my husband with me all the time....he IS always in my heart....but now it is both in my mind and around my neck. The stainless steele makes this a durable addition to the jewelry that will never fail. Thank you. I bought these items for my daughter in law and her sister. They both love them and can't wait to put a very special item in them. Gave one as a gift and she absolutely loved it!! Beautiful !! Did not like the chain so switched it out with another. Wear it every day!